Is you website ready for all possible devices and browsers? Users are browsing your websites on all possible web and mobile browsers; ranging from smartphones, palmtops, iPads, notebooks, tablets and more. 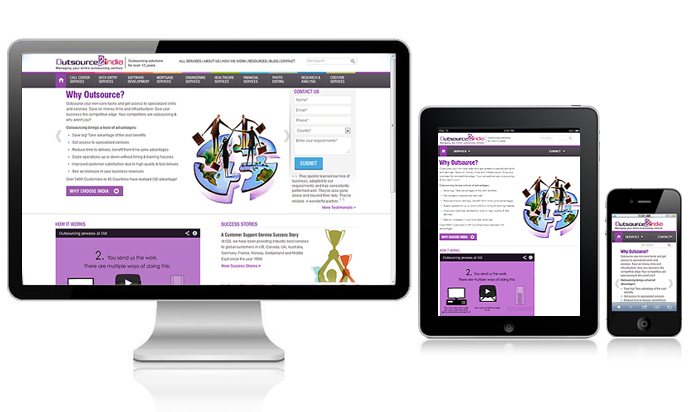 Responsive Web Design – What and Why? Responsive design is a relatively new paradigm of web development that aims at designing website in such a way that it is compatible across different web browsers and varying screen sizes. As a result of this coding practice, content automatically resizes when you shrink your browser. So, your website looks same in a desktop, laptop, iPad, tablet, Note, iPhone, Android or any other device. Why Only Responsive for Website Design? Consumption habits of audiences are undergoing a major shift across the globe. These days most of the web users own a smart phone, tablet or ‘Phablet’ (phones with large screen that looks like a tablet) and prefer accessing web on their hand-held devices. As more and more users are browsing your website and checking your product & service offering on their mobiles, your website needs to be mobile friendly and optimized to look great not only on larger screens (desktops), but on smaller screens (smart phones) as well, else you may soon lose out to competition. Once solution can be creating mobile apps for popular devices and browsers, as designing apps for about 2500 or more devices isn’t possible. Doing so, you stand a chance to lose out on users who may not be using a popular device for browsing your website! Responsive web design is the only solution to make your website look similar and equally appealing across all existing devices and platforms; and the ones that may arrive in future. Moreover, with responsive website design, you just need to create one code that will effortlessly fits all specifications and requirements. Access Technologies has been a pioneer at outsourcing software solutions in India and abroad, and is leading the forte when it comes to offshoring latest technology services that are still nascent for our competitors. Mobile compatibility on larger and smaller screens; right from Small Phones, to Smartphones, iPhones, iPad, Kindle, etc. In this age of instant boredom when users don’t bat an eyelid before switching preferences, you can’t afford to give your users a reason to move out to your competitors. User’s experience is paramount, outsource responsive web designing services to Access Technologies, and gift your users a consistent browsing experience on all mobile and web devices.